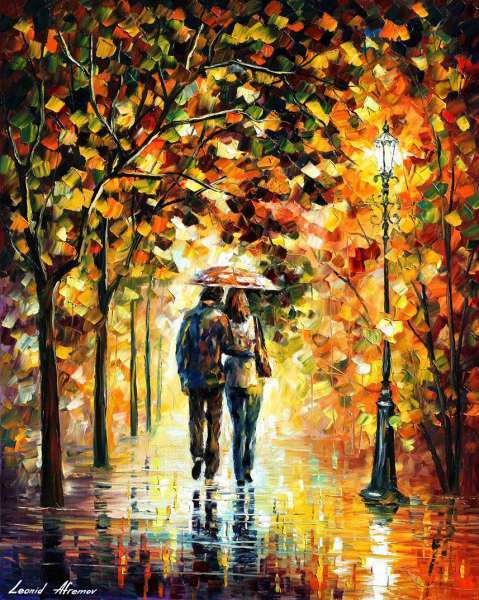 AUTUMN WALK — PALETTE KNIFE Oil Painting On Canvas By Leonid Afremov - Size 30"x36"
I would like to present my hand painted oil on canvas painting (recreation) of the artwork AUTUMN WALK. I made this piece with the same amount of soul and emotion just like the first original painting. This piece is created with oil paint on artistic canvas using my unique technique of a palette knife. The artwork has texture, you can feel the strokes by touching the painting. By purchasing on this site, you are buying directly from the artist Leonid Afremov. I guarantee your satisfaction and the best customer experience. Early fall is a short but marvelous period of time. The whole world cools down after the hot and dynamic summer flow. It becomes warm and very cozy like an early charming evening followed by a cup of tasty tea, soft plaid on shoulders and heart-to-heart talk with beloved ones. Our parks and streets transform their usual look: they become so colorful and a bit mysterious. People change too: their habits, behavior, mood become autumn-like; they hide in warm cafes from frequent cold rains, sincerely rejoice last sunny days, become more romantic and dreamy, prefer solitary walks and endless reflections. Early autumn is an ideal season for artists that are so inspired by nature miracles. They can hardly seize that immense palette of colors and their tints generously presented by autumn. They wander along lonely city streets being totally in love with those fabulous scenes around them and seek for inspiration. And to find it when autumn is at the peak of its beauty is as easy as shelling peas. Leonid Afremov, a famous praiser of charming autumn, perfectly feels and depicts its tiniest tones, notes and details. He hears its sweet melodies while it is raining and reads her touching poems on the wet pavement of the lonely street. A happy laugh of a girl, an amorous look of a man, warmth of hugs and heartiness of small talk, calm rain and soft steps, light of lanterns and evening moon – all these small and charming things are artfully depicted on the canvas called ‘Autumn Walk’. Viewers may admire a sweet couple of lovers that start their fascinating walk through this beautiful season together, hand in hand. They will face cold of rainy night and chilling wild, but even November with all its whims can be absolutely magic when you are in love. One of the benefits if this exclusive painting is that it can be purchased in several simple steps online any time you want to enrich your home art collection. Selling art online is a great chance for both – artists and collectors – to share priceless beauty without any serious obstacles. Secured by modern e-commerce technologies and guarantees, this kind of shopping becomes available all over the world. Selling art (paintings, prints and other creative decorations for your home) on different web-sources releases your imagination from any possible limits and gives you all the cards in hand.